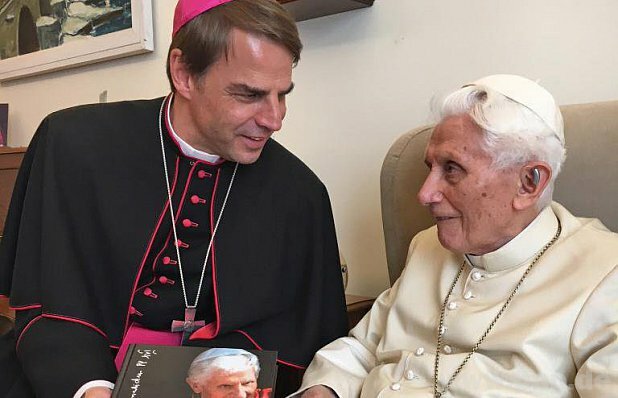 Catholic News World : German Bishop of Passau Supports Pope Francis "...I am grateful for his service and for this testimony!" German Bishop of Passau Supports Pope Francis "...I am grateful for his service and for this testimony!" Passau Bishop: He saw in Francis "no pope who would overturn the doctrine" or "the self-cover up or cook his own soup or make their own ropes" . Passau (kath.net) He "confided that Pope Francis wants to live and live by the power of the Holy Spirit, with all that is merely human, which also clings to him like every one of us." This is what the Passau Bishop Stefan Oster wrote on his blog not least in view of the current abuse and cover-up scandal that has plunged the US Catholic Church into a very violent crisis. Oster did not mention any keywords (such as the name of the suspected ex-Cardinal Theodore McCarrick or the emeritus Nuncio Carlo Viganò with his allegations). Nevertheless, it was clear what the Passau Bishop currently referred to. He confided that, according to Oster, Pope Francis "has, by virtue of his office, been given the special charism of the Spirit to govern the Church. And I think it is quite possible that just today, much of what in the Church is only vain, only lying or even evil and criminal, does not come to light because the Pope would make mistakes in his leadership, but much Rather, also because through his proclamation and his practice a light shines in which it becomes clear how much darkness, how much abysmal things there are in the church. This dark and abysmal, this lie and ambiguity, and indeed the criminal, can assert itself above all where the will to truth, the pursuit of holiness, truthfulness and love is too little pronounced. It can stay under the blanket wherever we as believers and, above all, we as Church leaders too over-reliantly live our faith, too careful of our own prestige and advantage, or over-arranged with everything that seems to us to be good and beneficial for the simple reason that people and societies of today want to see themselves confirmed in it. " He also sees "no pope who wants to overthrow the doctrine" or "who wants to cover up or cook his own soup or make his own ropes". Rather, he sees in Francis a Pope, "who wants to lead the Church consistently in a path of renewal, which is neither simply liberal nor conservative, but from the spirit of holiness, from the spirit of the Lord's presence, to be a witness to the world a place where every person can experience God's transforming love and become healer in his heart - and with him the world. " He concludes, he wrote, "Pope Francis, I am grateful for his service and for this testimony!"